I am coming to Perth in November 2014. It is my first trip over to west side of Oz, so I am very excited to meet you and share some knowledge. You are receiving this promotional email from me because you are on my database, either from having met with you at a trade fair or because you may have ordered books or ebooks or dvds from me over the years. I will be conducting classes for children of all ages. During the week there will be 1 hour classes after school, 2 introductory night lectures, and the main emphasis is a weekend seminar on sacred geometry. EarlyBird special applies only for the weekend seminar and ends 1 month before classes start on 10th October. The date of 27/10/2014 is the deadline for bookings which is 2 weeks before the start of events. Tuesday 11th: Mathemagics For StarKids (5 to 8 years old), afternoon, 1 hour. Wednesday 12th: Introductory Lecture on The Art of Number: from 7 to 9pm at another venue. Thursday 13th: Mathemagics For Juniors, (9 to 12 years old) afternoon, 1.5 hours. Friday 14th: Mathemagics For Teens, (13 to 19 years old) afternoon, 1.5 hours. Saturday 15th: Seminar For Adults: Sacred Geometry of Flowers: Divine Phi Proportion, full day. 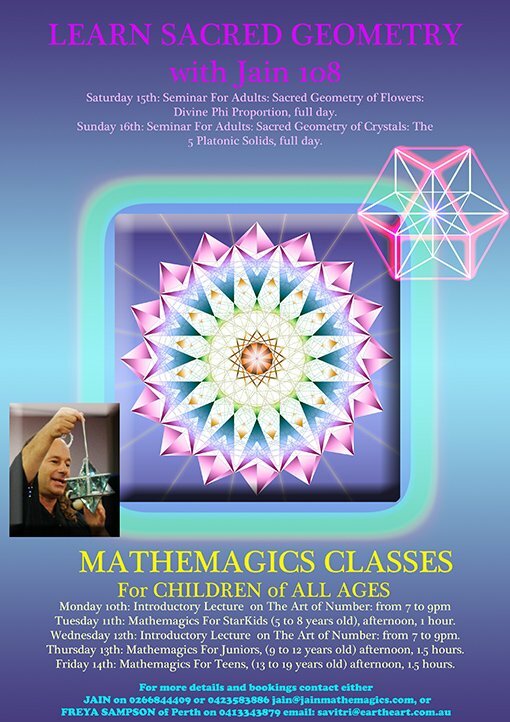 Sunday 16th: Seminar For Adults: Sacred Geometry of Crystals: The 5 Platonic Solids, full day. Jain is an international lecturer on Sacred Geometry and Vedic Mathematics. He has taught thousands of children all over Australia and overseas in his program called “Mathemagics” that teaches the translation of Number Sequences into Atomic Art. His book The Art of Number is a comprehensive summary of all the rare da-vinci-code-like patterns and sequences that constitute a new model for mathematical education, a step towards the creation of his Sacred Geometry University, currently being made available online. 7.00pm – 9.00pm – Jain has developed a new Steinerism or spiritual education, converting Number Sequences Into Atomic Art. 20% Discount is offered for bookings made for the Weekend Seminar until the 10th September. The price at the door in November is $160 per day or $140 concession/student is reduced to $128 or $112 conc. (20% of $160 is $128 and 20% of $140 is $112). Cost: $160 Concession $140 30 Page Workbook supplied. 4.00pm – 5.00pm – Cuboctahedron Net and Fold-Up Model. For every lesson, please bring your own pens, lead pencils, colour pencils, rulers, erasers, A4 notebook, compass (for adults only). (When you have a made an electronic payment, can you please contact Jain via email that this has been done).